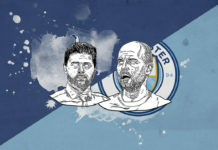 This article originally featured on totalfootballanalysis.com, our flagship analysis site covering player, coaches and matches from around the globe. After their midweek victory against Hoffenheim, Manchester City were back in the Premier League facing Everton. The second half of December is a tough period for football teams in England as they enter a series of nine games in less than a month, that started for City last weekend against Chelsea and ends after New Year. Pep Guardiola has put forth his objections against this habit of English football before, because is very demanding both physically and emotionally for his players. 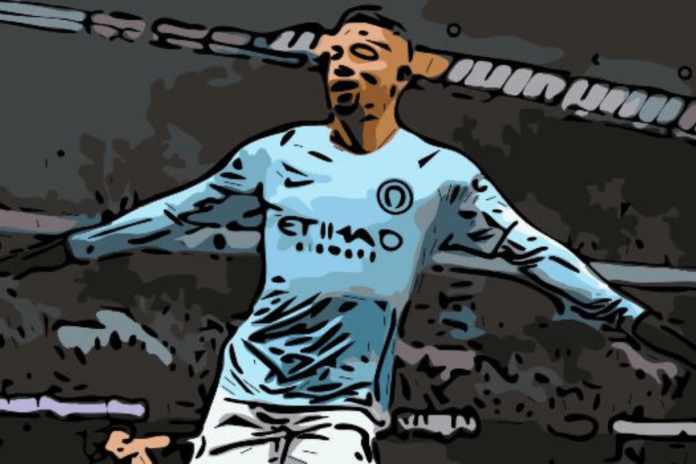 Still, Manchester City put in a decent performance in a strange game that put them back temporarily at the top of the Premier League before Liverpool beat Manchester United on Sunday. In this tactical analysis we will discuss how they managed this. It was a weird game. If you look at the final result, you could say it was a relatively easy game for Manchester City. If you were to look at the game highlights, you could conclude that the result was exaggerated and that it doesn’t show how tight the game was, or the clear chances Everton missed. If you watch the whole game, however, you can argue that actually Manchester City were in control most of the time. So how did the game develop? Everton started with 5-4-1 tactical setup, without pressing high up the pitch and putting a large number of players between the half line and the first quarter of their pitch to reduce spaces in that sector. Manchester City started with their classic 4-3-3, Fernandinho returning as centre midfielder, Gündogan and Bernardo Silva as inside midfielders and Sane, Gabriel Jesus and Mahrez in the forward line. 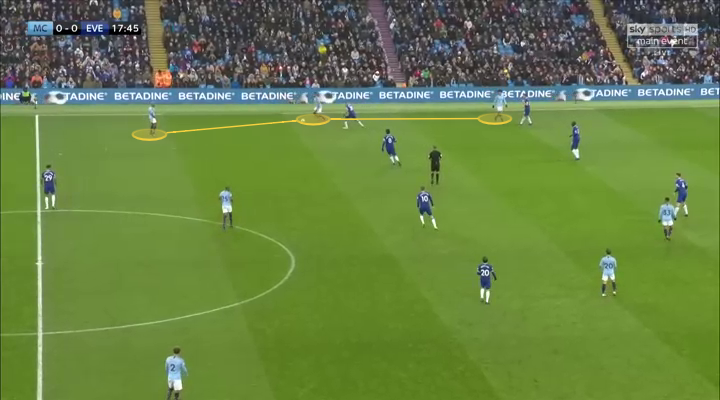 As Everton packed their half of the pitch, Pep Guardiola ordered his inside midfielders to play wider and try to receive the ball closer to the side-line. 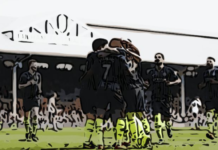 With three players on each wing, the wing back, inside midfielder and winger playing wide, the idea was to drag some Everton players out of the centre channel to open up spaces. 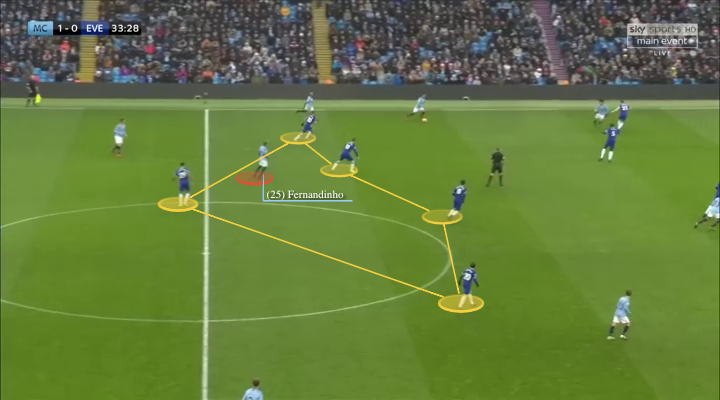 This gave Fernandinho a more important role on the build-up phase, as he was mostly the target man on that middle channel. With the ball in his feet, however, Fernandinho didn’t perform well in the first half. In his defence, he was isolated in the middle, usually surrounded by Everton players, but several missed passes were without a lot of pressure from his rivals. This resulted in few clear goal chances created by Manchester City in that period. In fact, during the first 15 minutes, Manchester City didn’t have a single attempt. 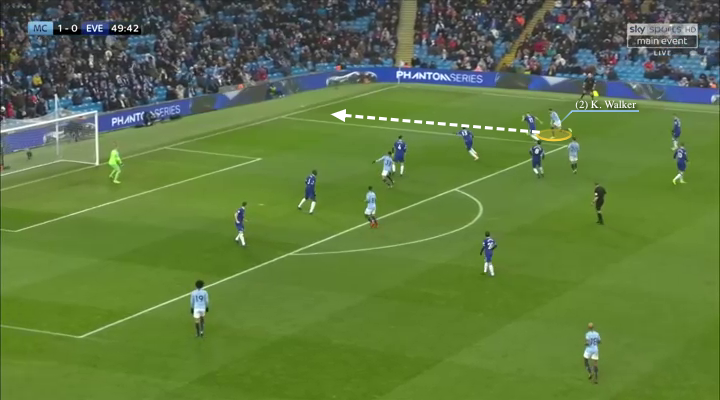 Having several players wide open and Fernandinho not precise with the ball in his feet resulted in mostly long balls played by the defensive line trying to look for Sane or Mahrez. 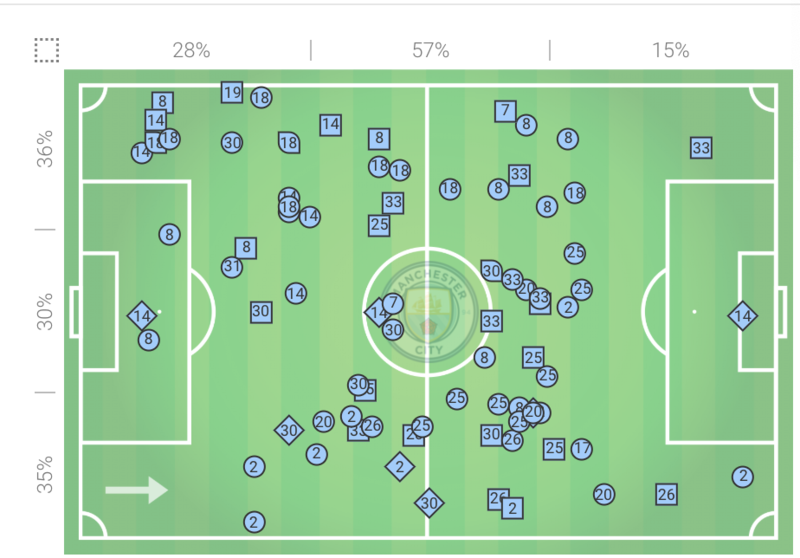 Most of the chances created came from high pressure against Everton that forced mistakes and resulted in possession recovered in Everton’s half of the pitch. Everton’s defensive line lacked solid positioning and was therefore more prone to being caught off guard by Manchester City. The image below shows how many balls were recovered just after the middle line closer to Everton’s goal area. Moreover, of the last 60 games of Manchester City, there were only five games where they recovered a higher percentage of the balls between the first two thirds of the pitch. On this game 73% of the recoveries were on those areas. The first goal, scored by Gabriel Jesus, came after an enforced error during Everton’s build-up that Manchester City recovered close to their goal area, as seen in the image below. After having scored once in the last 12 games, the Brazilian’s good performance didn’t only feature those two goals. He also showed some very interesting attacking movements that were hard to catch for Everton defenders. 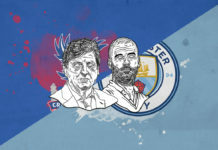 Trying to improve their creativity in the build-up phase, Manchester City tried to accelerate the rhythm of the game by accelerating the speed of the ball rather than that of the players. They switched play from one side to the other, looking to create more spaces, but the defensive positioning of Everton was solid and they suffered more defensively with the ball than without. On the defensive side, Manchester City were attacked mostly down their right side, where Kyle Walker was playing as wing back. Crossed balls caused damage to their whole defence, letting Everton create some very clear chances that could have ended in goals were it not for the profligacy of their players. The second half saw a much better performance coming from the right attacking line of Manchester City. During the first half, Bernardo Silva and Mahrez were unable to connect and their 1v1 didn’t work either. After halftime, Walker did participate more in the offensive build-up and that strengthened the right wing especially because of his style of attacking. 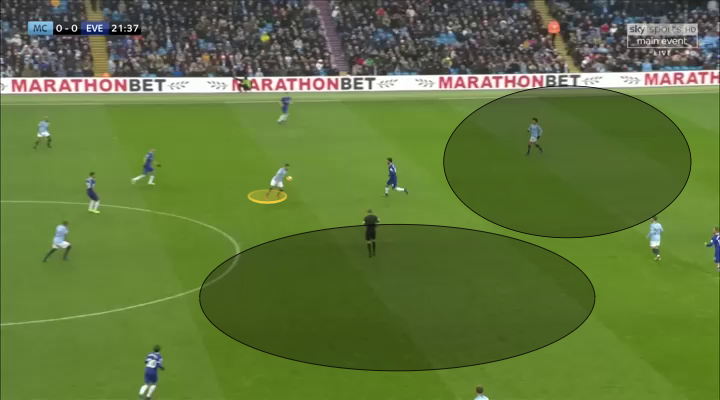 Usually, inside midfielders and wingers at Manchester City tend to receive wide and move with the ball diagonally into the centre of the pitch. Because Everton had placed so many players in that area, the game demanded more vertical attacking to use those spaces wide. Wing-backs usually do that better, because they tend to run to the by-line and try to cross the ball. 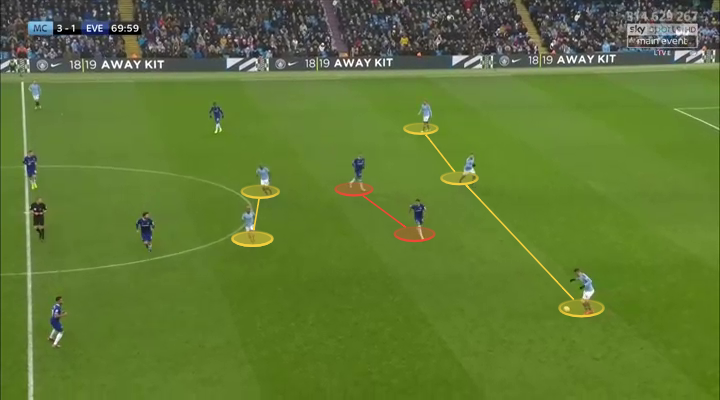 When you are more technical and more involved in the build-up, as inside midfielders, you will tend to move inside to connect through short passes with your teammates. This more vertical attacking display did cause more damage in the defensive line of Everton as they saw central defenders having to move wider to try to avoid the crosses, thus leaving spaces inside. That resulted in both the second and third goals for Manchester City, with good headers by Gabriel Jesus and Sterling. When Theo Walcott entered as a substitute, Manchester City immediately changed their attacking positioning. Leaving their initial 4-3-3 to form a 3-2-2-3, Delph stepped up next to Fernandinho. Following the rule of always having one more defender than their rivals’ forwards, facing two strikers meant Manchester City had to have three defending. Before, because Everton had only one forward, they played with four defenders but with both wing backs moving higher, leaving Otamandi and Laporte against Calvert-Lewin. Everton kept creating danger mostly on Walker’s side, having some very clear chances they weren’t able to convert. Their goal came from a miscommunication between Otamendi and Walker that left the Argentinian badly positioned and with spaces for Calvert-Lewin to head the ball home. The last couple of games have been tougher for Manchester City, with teams proposing very different defensive structures. It is positive to highlight that Pep Guardiola has been able to introduce flexibility into his players’ minds, allowing them to change their tactical arrangement to be able to beat those defences. That flexibility is key for the team to keep progressing both in the Premier League and the UEFA Champions League. There is still to work to do, mind, with the team conceding goals in most of their previous games: the last six to be precise. That is a work in progress for Guardiola and all his players. Nicolas from Chile, finishing my football coach studies. Love South American football in the stands and European football in the field. That's why the World Cup is unique.